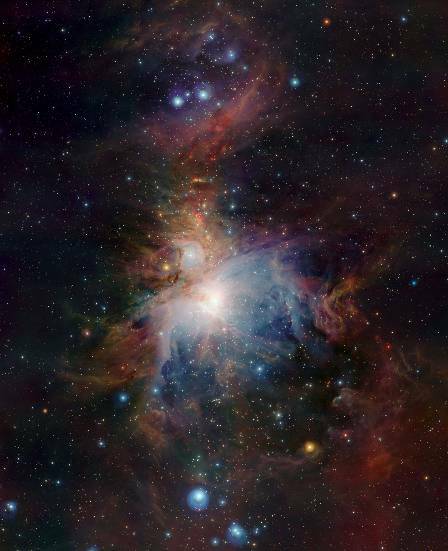 Images taken by the world's largest infrared telescope have revealed new details of the Orion Nebula. Its hidden secrets are shown in a dramatic image taken by the European Southern Observatory's new VISTA survey telescope. The telescope’s huge field of view can show the full splendour of the whole nebula and its infrared vision also allows it to peer deeply into dusty regions that are normally hidden and expose the curious behaviour of the very active young stars buried there. VISTA — the Visible and Infrared Survey Telescope for Astronomy — is the latest addition to ESO’s Paranal Observatory (eso0949). It is the largest survey telescope in the world and is dedicated to mapping the sky at infrared wavelengths. The large (4.1-metre) mirror, wide field of view and very sensitive detectors make VISTA a unique instrument. This dramatic new image of the Orion Nebula illustrates VISTA’s remarkable powers. VISTA's infrared view of the Orion Nebula. The Orion Nebula  is a vast stellar nursery lying about 1350 light-years from Earth. Although the nebula is spectacular when seen through an ordinary telescope, what can be seen using visible light is only a small part of a cloud of gas in which stars are forming. Most of the action is deeply embedded in dust clouds and to see what is really happening astronomers need to use telescopes with detectors sensitive to the longer wavelength radiation that can penetrate the dust. VISTA has imaged the Orion Nebula at wavelengths about twice as long as can be detected by the human eye. As in the many visible light pictures of this object, the new wide field VISTA image shows the familiar bat-like form of the nebula in the centre of the picture as well as the fascinating surrounding area. At the very heart of this region lie the four bright stars forming the Trapezium, a group of very hot young stars pumping out fierce ultraviolet radiation that is clearing the surrounding region and making the gas glow. However, observing in the infrared allows VISTA to reveal many other young stars in this central region that cannot be seen in visible light. Looking to the region above the centre of the picture, curious red features appear that are completely invisible except in the infrared. Many of these are very young stars that are still growing and are seen through the dusty clouds from which they form. These youthful stars eject streams of gas with typical speeds of 700 000 km/hour and many of the red features highlight the places where these gas streams collide with the surrounding gas, causing emission from excited molecules and atoms in the gas. There are also a few faint, red features below the Orion Nebula in the image, showing that stars form there too, but with much less vigour. These strange features are of great interest to astronomers studying the birth and youth of stars. This new image shows the power of the VISTA telescope to image wide areas of sky quickly and deeply in the near-infrared part of the spectrum. The telescope is just starting to survey the sky and astronomers are anticipating a rich harvest of science from this unique ESO facility. 1. The Orion Nebula lies in the sword of the famous celestial hunter and is a favourite target both for casual sky watchers and astrophysicists alike. It is faintly visible to the unaided eye and appeared to early telescopic observers as a small cluster of blue-white stars surrounded by a mysterious grey-green mist. The object was first described in the early seventeenth century although the identity of the discoverer is uncertain. The French comet-hunter Messier made an accurate sketch of its main features in the mid-eighteenth century and gave it the number 42 in his famous catalogue. He also allocated the number 43 to the smaller detached region just above the main part of the nebula. Later William Herschel speculated that the nebula might be “the chaotic material of future suns” and astronomers have since discovered that the mist is indeed gas glowing under the fierce ultraviolet light from young hot stars that have recently formed there.